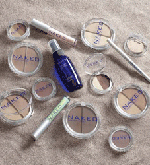 100% Pure Mineral Makeup from Naked Minerals™! I was a huge Bare Essentuals™ fan, until I was introduced to this line. All the powders are double pressed, so I don't have to worry about spilling it on the floor or making a mess on my bathroom countertop any more. One word I like to use when describing this makeup is "Illuminating". Once I finish off my look with Crystal Fusion and Neroli Mist my face illuminates. I look moisturized and healthy. No Mess, Illuminating and best of all, it feels like you are wearing NOTHING at all. I suppose that's why the call it "Naked" Minerals™! Click Here to go IMNatural.com's ordering page.